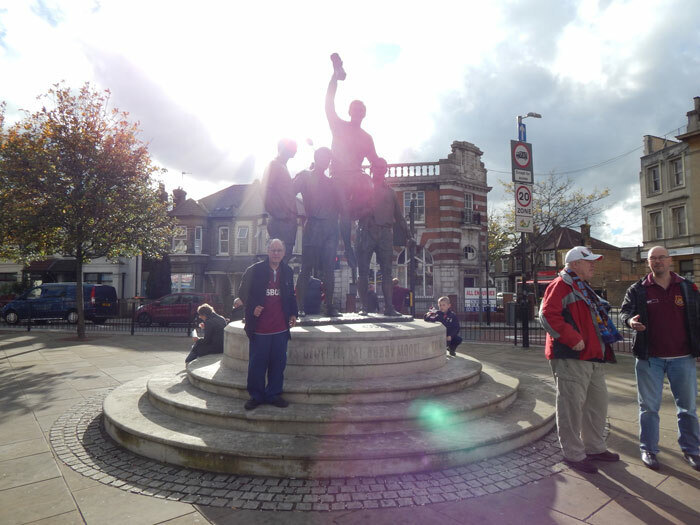 Kevin Murphy illustrates how he managed to broaden his horizons, meet new people and travel – and all for his love of West Ham Football Club. I have been a part of WALK since 2002. Sport is a huge part of my life, particularly football. I enjoy watching football – both through going to games or watching on TV- and talking about the highs and lows the next morning with friends in work. I live in Inchicore in Dublin and regularly take trips on the LUAS to Tallaght to watch Shamrock Rovers, but my club is West Ham United. I’ve been supporting West Ham since 1974. I’ve been asked ‘’Why West Ham! ?’’, but I always enjoyed the style of football they played, particularly under the manager John Lyall. West Ham were relatively successful at the time. They won the FA Cup in 1975 and the following year they got to the European Cup Winner’s Cup Final, although we were beaten by Anderlecht. My father followed Aston Villa, so it was a claret & blue house! Although I’d been following West Ham for a long time, I never really met other West Ham fans in Dublin. I discussed this with my keyworker at one of my planning meetings in the Summer of 2012. I thought it would be great to find like-minded fans to meet up and watch West Ham games. A quick Google search later, and The Dublin Hammers turned up! The Dublin Hammers are a West Ham Supporters Club based in Dublin. They meet up regularly in Branningan’s Bar on Cathedral Street in Dublin City Centre to watch West Ham games. This sounded perfect. Jimmy Conway was the contact in the club. We contacted Jimmy to get more information about the Supporter’s Club and to express an interest in becoming a member. Jimmy was extremely helpful and said I would be more than welcome to join the Supporters Club. As the season in England was coming to an end, and wasn’t due to start again until the end of August, I had a bit of time to work on becoming familiar with Brannigan’s Bar and importantly, how to travel there from my house. Over the next couple of months, I worked on figuring out the route and becoming comfortable with travelling it. This involved getting the Luas from BlackHorse to Abbey Street and identifying landmarks, which would help me find Brannigan’s Bar. I also took the time to get comfortable using my mobile phone in case I needed it. On 23rd August 2012 – two days before the first meeting of the Supporters Club in Brannigan’s Bar, I travelled independently from Inchicore to Brannigan’s Bar. I agreed that a staff member would also do the journey, but they would do it a half an hour after I left. I got the Luas from Blackhorse. I got off at Abbey Street and began looking for the landmarks. The Spire. Check. Burger King. Check. Spar. Check. And there was Brannigan’s. The staff member arrived shortly after. 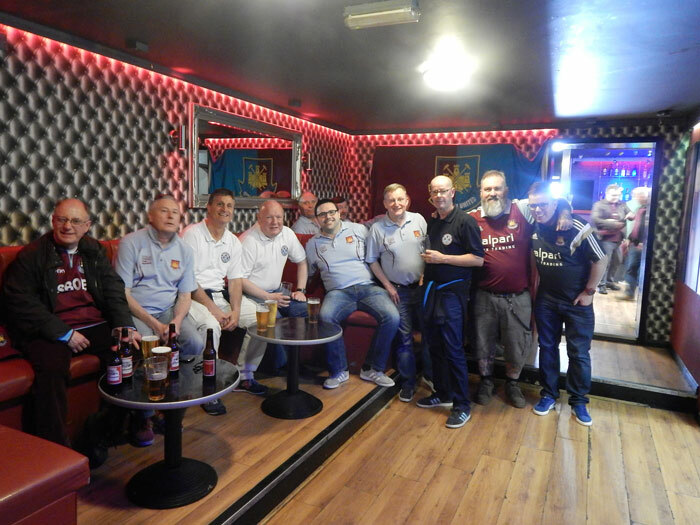 I told them how comfortable I was doing the journey independently, and was looking forward to travelling independently on Saturday and meeting Jimmy and the other Supporter’s Club members. A couple of months passed and I was regularly travelling into Dublin City Centre to meet up with the Club. I looked forward to the meetings. It was a great atmosphere in the Bar. Cheering every Hammers’ goal and bemoaning every goal against. It was great experiencing these moments with my fellow supporters. I was turning 60 in May 2013, and I was planning on having a party in the Red Cow. I had invited Jimmy from the Supporter’s Club and I was delighted he was able to make it. It was a fantastic night spent with many of my friends, with the occasional glass of red wine and Neil Diamond sing-along! That night, Jimmy had mentioned that the Supporter’s Club were running an overnight trip to Cork in July to see West Ham play a pre-season game v Cork City, and asked would I be interested in going. It’s not everyday West Ham come to Ireland, so I was excited about this opportunity and expressed my interest in going on the trip. Jimmy passed on the details and over the next couple of weeks I worked on making the relevant bookings (train tickets, match ticket and a room in The Metropole Hotel in Cork – a beautiful hotel). I intended to travel independently to Cork with the Supporter’s Club. Jimmy met with a member of staff in WALK to discuss the trip in detail. Jimmy said the other lads in the Club were always very positive about my involvement with the Club and that we were all there for the same reason – to support our team! Jimmy felt this trip was something I could do without staff support. Jimmy felt that I had settled into the Club well and I was completely comfortable with everyone in the Club too. Jimmy and the staff member exchanged the relevant contact numbers and it was all systems go. Now, I needed to spend time to figure out how to travel from Blackhorse Luas Stop to Heuston Station because this is where I would be meeting the lads from the Supporter’s Club to catch the train to Cork. I did several trial runs – both with and without staff supporting me. I was comfortable travelling independently on this route ahead of the match date. Another thing I worked on was identifying and becoming familiar with things in Heuston Station such as the location of ticket kiosks, platforms and toilets to avoid confusion on the morning of the trip. Jimmy agreed to meet me at the Heuston Luas stop on the morning of the trip, where we would both go and collect our train tickets together. We were able to book our seat together on the train – which was great – as we were able to keep each other company and discuss the game that evening – we were both really looking forward to it! Having seen West Ham come to me, it was now my turn to go and see West Ham in London. I didn’t have long to wait. 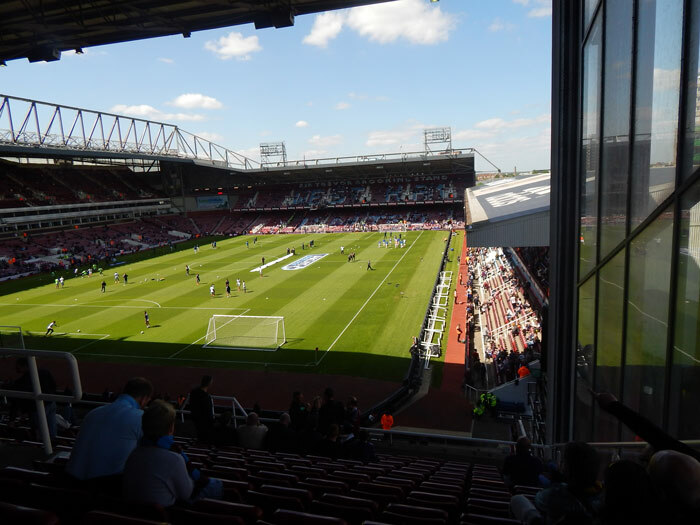 The Supporter’s Club were running a trip to see West Ham v Aston Villa on at the start of November. The group intended to stay overnight, however I preferred to do a day trip. A staff member from WALK would travel to London on the flight with the Supporter’s Club, and after the game I would arrange to meet the staff member and travel back to the airport to head home. My deposit for the trip was paid, my seat on the Supporter’s Club bus was booked, my flights were booked, my match ticket was booked and I was all set to go. On the morning of 2nd November 2013 – a staff member and I travelled to the airport to meet the lads in the Supporter’s Club. We were all booked on the same flight, which was great. Upon touching down in London Stansted, the staff member exchanged numbers with the one of the guys in the Supporter’s Club and we arranged a meeting point after the game. Unfortunately the game ended 0-0 – there is nothing worse than going to a football game that ends 0-0! The consensus amongst the Group was that it was two points dropped, but I had enjoyed the day and my first experience travelling to London with the Supporter’s Club. I promised myself it wouldn’t be the last. Over the next couple of months, I continued to travel regularly into Brannigan’s Bar in Dublin City Centre to meet up with the Club and watch games on TV. The Club then announced plans to travel to London in May 2014 to see the game v Tottenham Hotspur – the derby! What a game that promised to be – I knew I just had to be there. It was very similar to the last trip the Club ran in November 2013. The Club planned on staying overnight, but I preferred to do a day trip. I agreed a staff member would travel with me again to London, that I would head off with the Club for the match and afterwards I would meet up with the staff member to travel home. I paid the deposit and made the relevant bookings. It was just a waiting game now. The morning of May 3rd arrived and the staff and I travelled to meet the Club – bright eyed and bushy tailed, in Dublin Airport. Again, we were on the same flight and we were all in jovial mood. West Ham v Tottenham is one of the biggest games of the season if you’re a West Ham fan, and I felt really fortunate and excited to be going to see this game. Going into the game, West Ham weren’t playing particularly well of late and Tottenham were in a good run of form, but ever the optimist, I was hopeful of a West Ham win! On a beautiful summer’s day in East London, West Ham put in a great performance to win the game 2-0. I thoroughly enjoyed the game and it made the journey home a happy one. 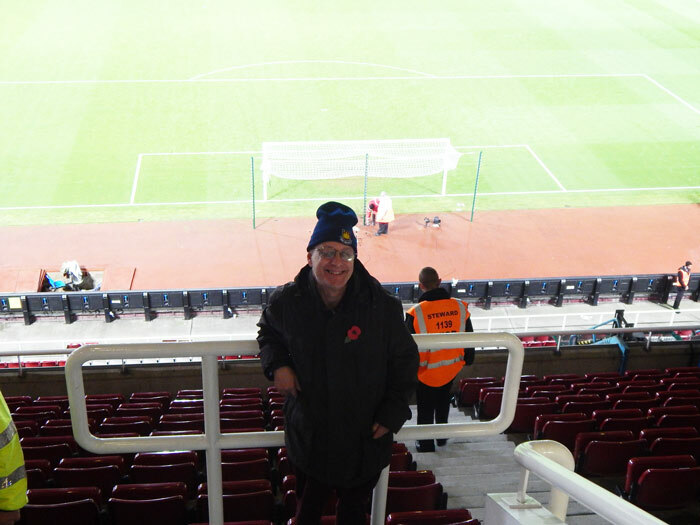 I’ve been on three more trips to London with the Supporter’s Club – in November 2014, May 2015 and October 2015. In November 2014, we drew 0-0 with Aston Villa – again! – Which was like déjà vu from my first trip in November the previous year! In May 2015, we were beaten 2-1 by Everton – where I saw my record of West Ham never being defeated disappear! And my most recent – and arguably my most enjoyable – trip was in October 2015, where we beat Chelsea 2-1 in another derby game. I particularly enjoyed that Chelsea game as the 2015-2016 Season represented the last season of West Ham playing in Upton Park before they moved to the Olympic Stadium in the summer of 2016. That famous old ground has been home to West Ham since 1904. When I went to visit family in London in 1974 – as a student at the time, I went to Upton Park to watch West Ham. 41 years later, I was possibly watching them play in that same old ground for the last time. It was great to win the game on the day to ensure my last memory of Upton Park was a happy one! When West Ham move to the Olympic Stadium in the summer of 2016, it will open a new chapter in the club’s history and a new opportunity for myself too. I watched the London Olympics on TV in 2012 and was impressed by the stadium. It looked fantastic. I look forward to my first and many more trips to the Olympic Stadium with the Supporter’s Club to seeing West Ham play. Hi, I’m Kevin, I live in Inchicore. I’ve got lots of interests: dancing classes, choir, guitar lessons, going out to gigs – anything to do with the music side of things. One of my biggest loves is my work. I work part time in 2 cafes and a bar. I enjoy learning new skills and working as part of a team. 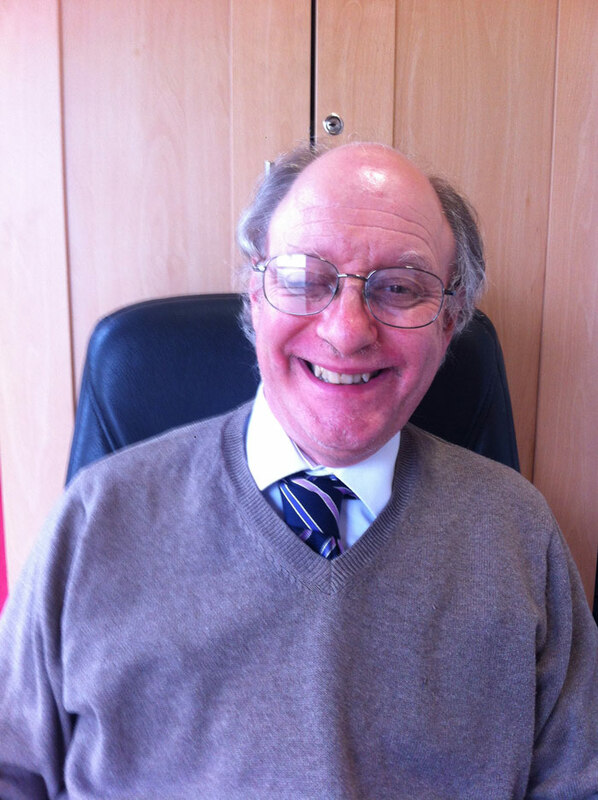 I enjoy meeting the customers and looking after their needs. I enjoy the banter with the other staff and the customers. I am also a serious sports fan – soccer, rugby and gaelic. Developing this passion and meeting new people through it is what this article is about.